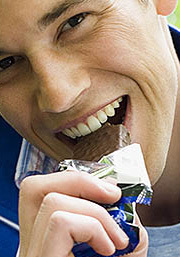 Natural Health News — Eating a moderate amount of chocolate each week can lower the risk of stroke in men, according to a new study. Swedish researchers surveyed the diets of more than 37,000 men aged 49 to 75. The men were given a questionnaire that assessed how often they consumed various foods and drinks and were asked how often they had chocolate. Researchers then identified stroke cases through a hospital discharge registry. Over 10 years, there were 1,995 cases of first stroke. Their findings were published in the journal Neurology. Men in the study who ate the largest amount of chocolate, about one-third of a cup of chocolate chips (63g) per week, had a lower risk of stroke compared to those who did not consume any chocolate. Those eating the highest amount of chocolate had a 17% lower risk of stroke, or 12 fewer strokes per 100,000 ‘person-years’ compared to those who ate no chocolate. Person-years is the way scientists express the total number of years that each participant was being studied. The researchers also conducted a larger analysis of five studies that included 4,260 stroke cases. This showed that the risk of stroke for individuals in the highest category of chocolate consumption was 19% lower compared to non-chocolate consumers. For every increase in chocolate consumption of 50 g per week, or about a quarter cup of chocolate chips, the risk of stroke decreased by about 14%. “The beneficial effect of chocolate consumption on stroke may be related to the flavonoids in chocolate. Flavonoids appear to be protective against cardiovascular disease through antioxidant, anti-clotting and anti-inflammatory properties. It’s also possible that flavonoids in chocolate may decrease blood concentrations of bad cholesterol and reduce blood pressure,” said study author Susanna C. Larsson, PhD, from the Karolinska Institute in Stockholm, Sweden. Other studies have looked at how chocolate may help cardiovascular health, but this, says Larsson, is the first of its kind study to find that chocolate, may be beneficial for reducing stroke in men. “Interestingly, dark chocolate has previously been associated with heart health benefits, but about 90% of the chocolate intake in Sweden, including what was consumed during our study, is milk chocolate,” she added.